There is more to license monitoring than just counting the number of used licenses and presenting usage statistics. OpenLM incorporates many features that optimize the usage, availability, maintenance, compliance and purchase of expensive concurrent licenses. One such feature is the License utilization window. Optimal License Utilization does not merely mean the high-water mark of licenses taken. A good insight to license usage should answer the question: “How many licenses can I get along with?”. In the OpenLM EasyAdmin web application, click Start → Management → License Utilization. This bar chart represents a histogram of license usage, i.e. each column ‘x’ answers the question: “what is the percentage of time in which x licenses have been in use”. This form of presentation ignores momentary usage peaks, and provides a vivid realization of the true license consumption pattern. 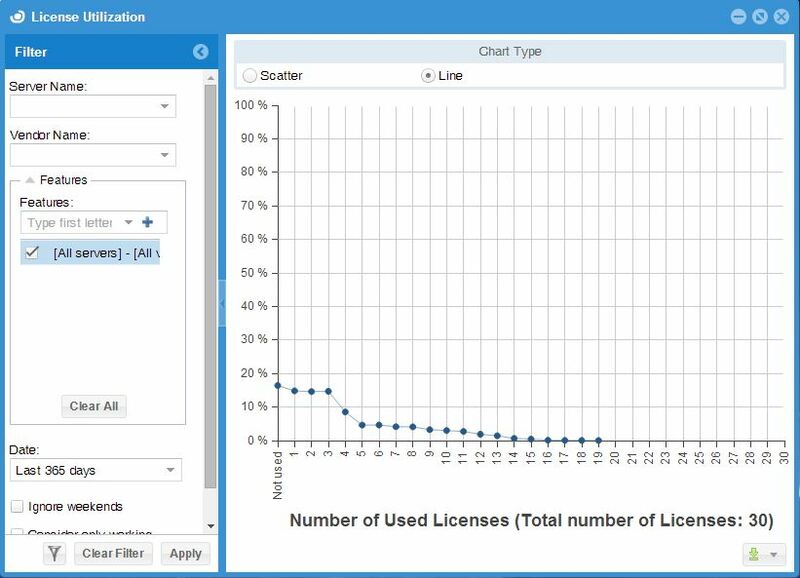 It clearly depicts the number of licenses that are actually required in the organization. 2 licenses in use approximately 14% of the time etc. According to the chart, no more than 19 licenses of the 30 available were ever used within the selected timeframe. Moreover, license usage beyond 14 licenses seems negligible (less than 1% used over a 365 day span). This information may prove very handy when considering future license maintenance and procurement.